It has happened to us all. As we are driving our car or our boat, a rock or other piece of debris pops up and hits the windshield. A broken windshield must be fixed quickly in order for you to drive your vehicle – whether it is a car, truck or boat. If you happen to need your boat windshield repaired (or replaced) look no further than Anchor Marine Repair to get the job done right. At best, ignoring a busted windshield can be dangerous and can impede your ability to see while driving and, at worst, pieces of the windshield can break off and hurt someone. Our team has been completing all types of boat repairs for more than 30 years and brings knowledge, experience and professionalism to each and every boat repair job. Our team has specific experience repairing Ranger windshields. We can get your boat back on the water quickly, with minimal impact on you. In addition, if your boat was damaged in a storm, or involved in a collision which caused the windshield to crack, we may also be able to help you with an insurance claim. If your windshield is cracked, you should have it repaired as soon as possible. The team at Anchor Marine Repair is committed to helping you with the repair process, from start to finish. Our team shares your passion for boats and the water and we strive to make the repair process as easy as possible. 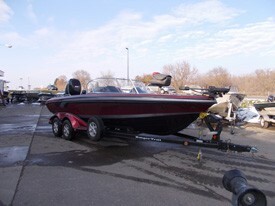 We can even transport your boat to and from our state of the art facility in Delano, MN (within 250 miles). In addition to Ranger windshield repair, the team at Anchor Marine Repair can also replace broken windshields, complete all types of boat renovations, complete transom repair, metal flake repair, boat collision repair as well as storm damage repair. Our 10,000 square foot facility has two buildings and two spray booths so that we can work fast and get you back on the water as soon as possible. We can accommodate boats up to 38’ in length. Anchor Marine Repair has worked with many boat owners in the MN area over the last 3 decades and has built a strong reputation for top notch customer service and the highest quality boat repair in the area. If your boat needs to be repaired this season, call our team at 763-972-3540. We will get your boat back to pre-accident condition fast, so you can enjoy the water once again.